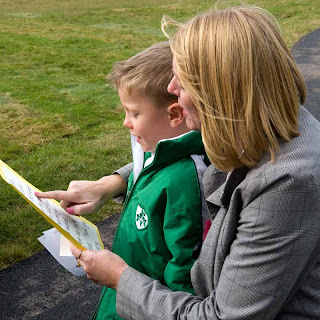 West Royalty Elementary School officially opened its new kindergarten wing on November 1, 2010. Here are some pictures of the event. 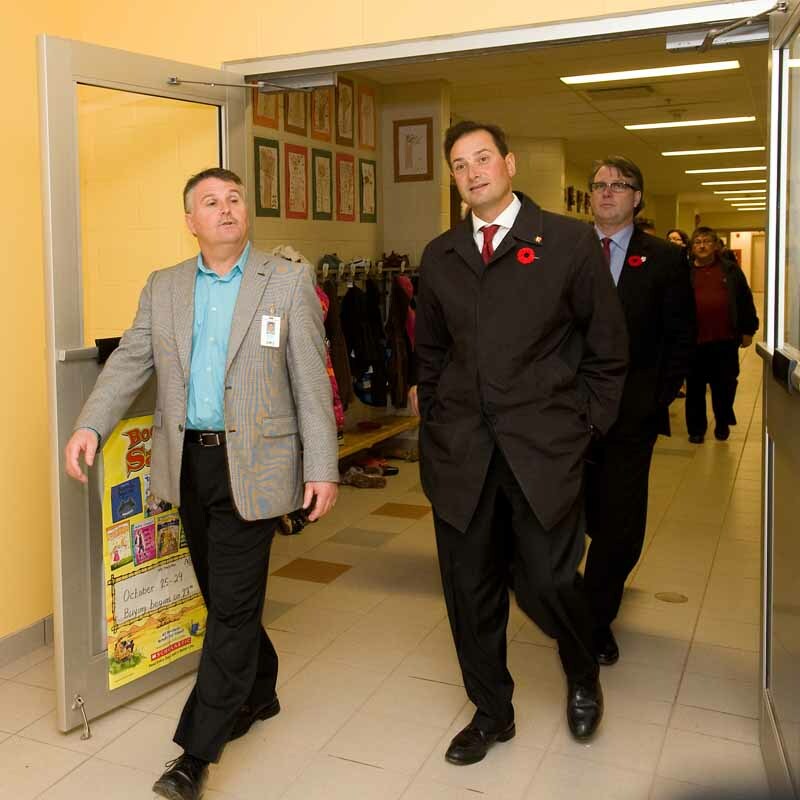 Premier Ghiz enters the new Kindergarten Wing of West Royalty Elementary School for the first time accompanied by Principal Ken Gaudet and Minister of Education and Early Learning Doug Currie. West Royalty Elementary music teacher Sandy Zinck leads the Kindergarten students in a rousing rendition of, "If you are happy and you know it". The invited guests happily clapped and sang with the children. Kindergarten student Liam Chatfield assisted by his teacher Anita Smith-LeClair thank Premier Ghiz for their beautiful new space for learning. 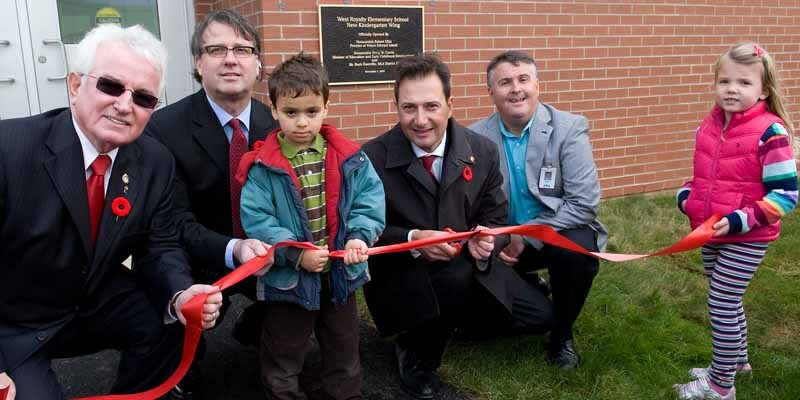 MLA Bush Dumville, Minister Doug Currie and Principal Ken Gaudet assisted by kindergarten students Zakaria Sefau and Hannah MacLean assist Premier Ghiz as he cuts the ribbon opening the new West Royalty Kindergarten Wing. 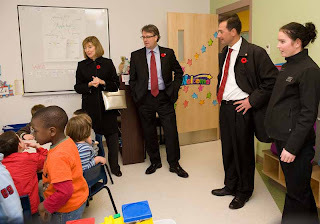 PEITF President Carrie St.Jean, Minister Currie and Premier Ghiz join kindergarten teacher Erin Acorn and her class as they enjoy a treat in celebration of the official opening of the new West Royalty Kindergarten Wing. 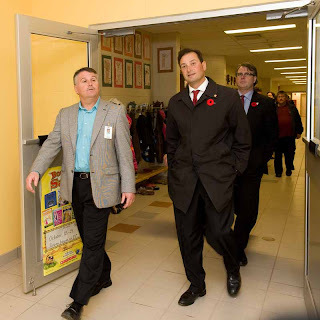 Grade 3 students Jordan MacKinnon and Brett Curley took advantage of Premier Ghiz's visit to give him a thank you letter for the Premier's many contributions to our community.